Holiday Cheer for FUV with Conor Oberst and Friends in 2014 was rich with musicians who bring a storyteller's character-driven perspective and an empathetic eye to the soulful architecture of their songs. 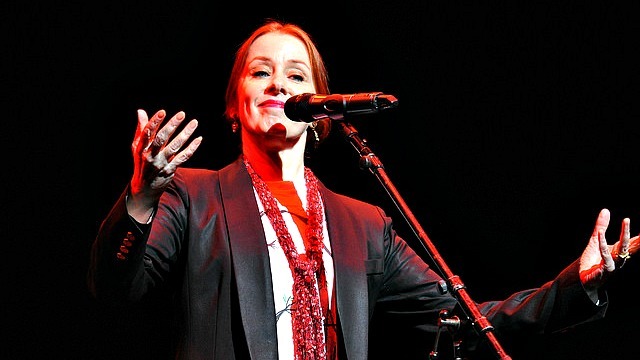 We're so happy that one of New York's most poignant and potent lyricists, Suzanne Vega, performed at this benefit concert for the station. Suzanne joined her friend Conor Oberst as well as Natalie Merchant, Laura Marling, The Lone Bellow, The Felice Brothers and Jonathan Wilson at the Beacon Theatre. Over a career spanning more than 30 years, Suzanne Vega has released eight studio albums, from her 1985 self-titled debut to her most recent album—and first release in seven years—Tales from the Realm of the Queen of Pentacles. Not unlike her late friend Lou Reed, Suzanne lyrically captures the jagged rhythms, grey vistas, pavement dramas and restless tumult of New York City and its denizens. She looks beyond the five boroughs too, but never forsakes her steely honesty, dry wit and a soft, sometimes wounded heart. A cavalcade of melancholy romantics, sharp-tongued misfits, and misbegotten dreamers roam and ruminate throughout Suzanne's songs as if lost souls in a Chekhovian play. Some innocently rue half-filled cups of coffee on a rainy day, only to become part of Manhattan mythology ("Tom's Diner"); others wistfully yearn for an elusive lover ("Gypsy"), burn with febrile desire ("99.9F") or cloak themselves willfully in black, like "outlaws and dancers" ("I Never Wear White"). Suzanne's scope of influence is not limited to other folk rock artists either. Producer Danger Mouse reached out to her for 2010's Dark Night of the Soul, his collaboration with the late Sparklehorse. Transplanted Briton Dev Hynes, aka Blood Orange, is a devout fan, telling the New York Times last year: "Suzanne Vega is a big influence of mine, and I don’t talk about it a lot. The first three albums particularly, the storytelling, the texture of her voice, it’s definitely something I’ve always thought about." She's certainly been a big influence on WFUV and much beloved by our listeners for a long time. At Holiday Cheer for FUV Suzanne played two beautiful songs from Tales from the Realm of the Queen of the Pentacles, accompanied by album producer and co-writer Gerry Leonard on guitar. Later in the evening, she also joined Conor Oberst on her own song, "Headshots."